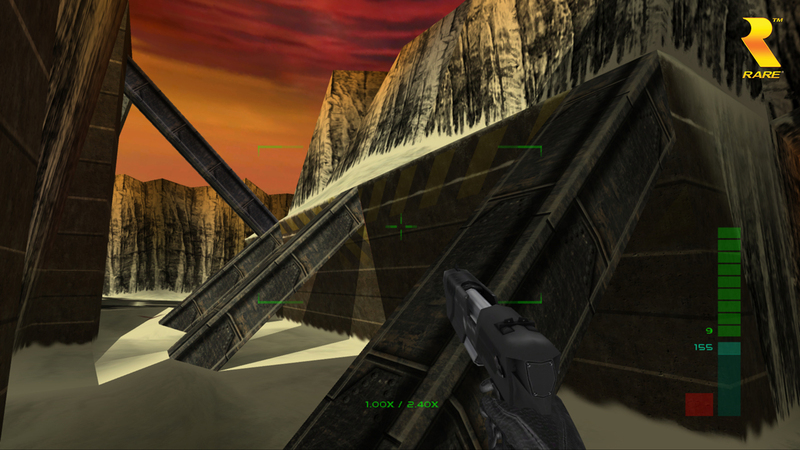 Perfect Dark on the N64 set a new standard for first person shooters when it came out. Rare needs to release good games so they decide they can remake the game for Xbox 360's Live Arcade. The visuals look slightly upgraded and I hope the porting team does a good job of replicating the revolutionary, but now outdated gameplay to the 360. Continue reading to look at the new screenshots the developers have released to increase my personal hype. Here is a little background prior to the pics. It seems that 4J Studios is handling the port. They promise online and offline multiplayer with 1080p and 60FPS. Straight off the bat, I challenge that the 360 can render a true 1080p image. The game will probably be upscaled from 720p knowing the development trends on 360. If the studio can pull off a true 1080p video, which should be possible since this is ancient technology and a computer can render the base game as high as possible. I have to be skeptical because I don't want a poor port of one of my favorite games. I'll start with my personal favorite screenshot. Observe the very nice looking face of the DataDyne guard woman. She actually looks like she is wearing earrings and I'm digging her white pants. The textures of the city and the desk look excellent for the source material. Next, look at the next gen Carrington Villa. 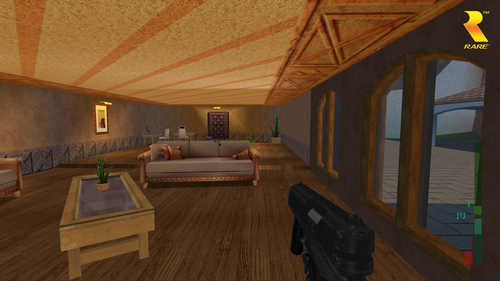 Perfect Dark sure is not rendering any next gen shadows when you look outside the windows. This requires some soft shadows! The lighting in this screenshot is also poorly done in comparison to the other screens. I would expect there to be more light flare on the roof next to the light source rather than far away. I'm probably nit-picking too much but this is a screenshot the marketing team released and I have the right to judge their game. The edges of the objects in the room are good; they are smooth enough to remind me that real objects are not jagged. 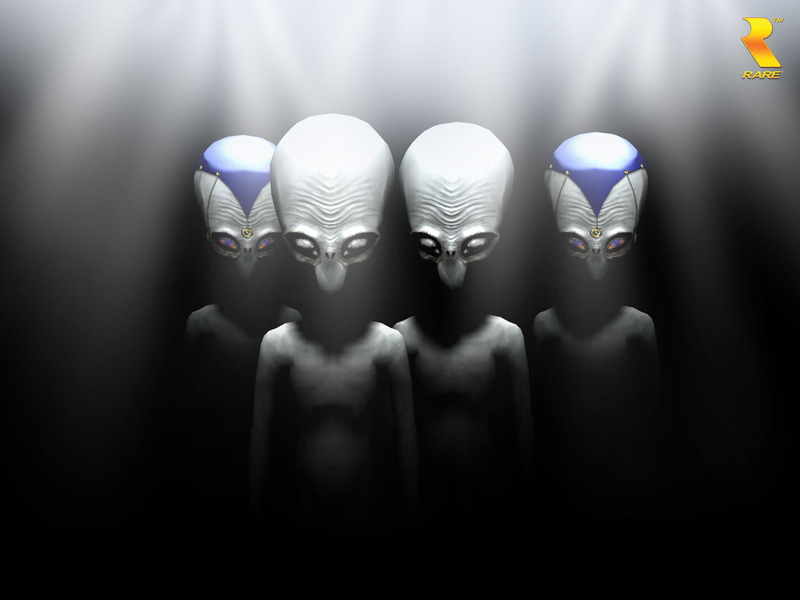 Moving on to what appears to be the outside of start of the first Area 51 mission, I am again hit with the poor shadows. Why can't they be more diffuse so they aren't as sharp and I don't see lines. There should be a new shadow/darkness engine created to give more contrast. Since this is one of the newer screenshots, I doubt the programmers will spend the time to fix the shadows. 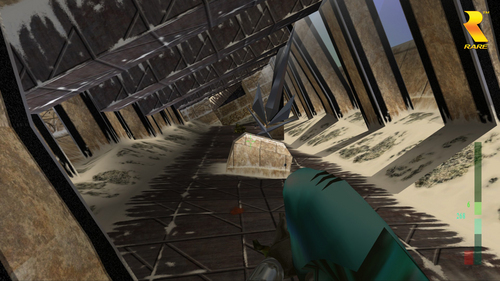 Another thing with the picture is how horrible the ground texture meshes with the wall textures. It looks like they didn't even try to make it match. I can't even tell if the ground is supposed to be snow, it looks more like mashed potatoes. 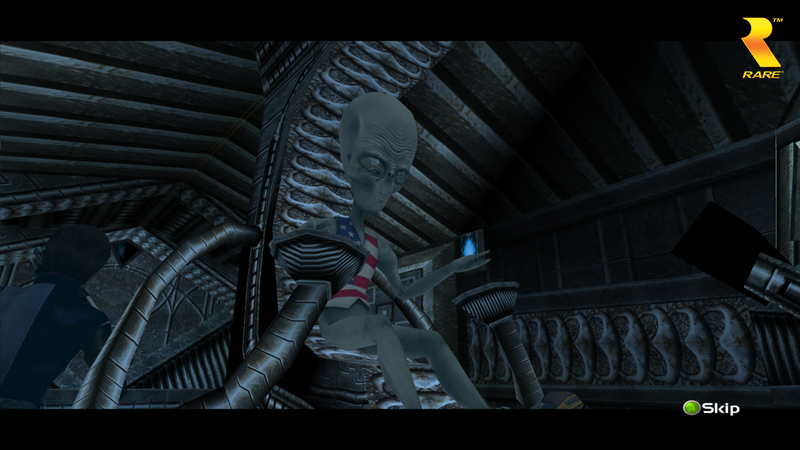 Now here are some exciting alien screenshots. 4J Studios and/or Rare are taking some chances by upgrading the character textures. Some like Elvis look excellent with the eyes looking like alien eyes should. The Skedar texture is decent and is what I would expect from an upgrade. Take a look at that FarSight! Now that's a bold style for what is the cheapest weapon ever created. I actually like the new design and I hope the developers slow down the "autoseeking" secondary fire for competitive multiplayer. 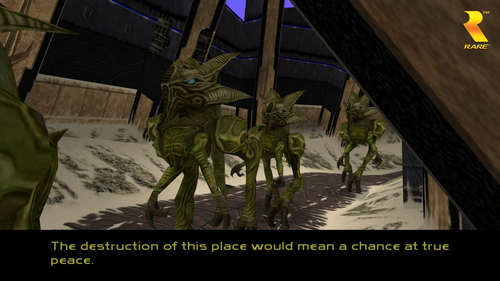 The game featured an incredible single player campaign with high production values and visuals. You know that thing called Co-op play that Gears made "popular"? 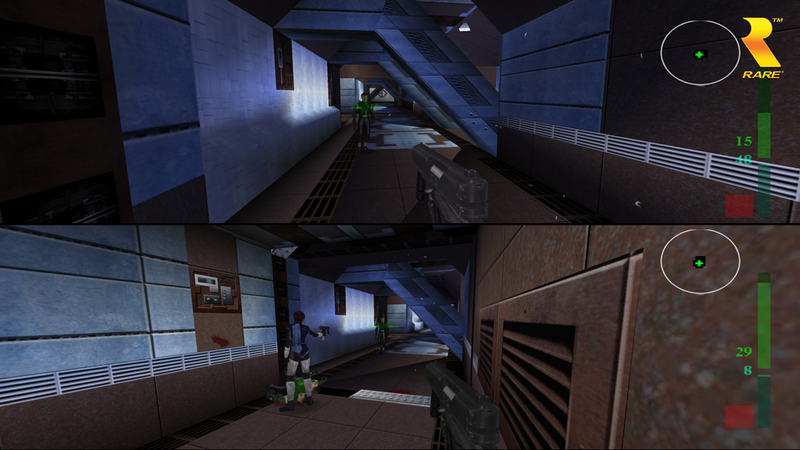 Yeah, Perfect Dark accomplished this back on the N64 with splitscreen 2 player cooperative or counter-operative. 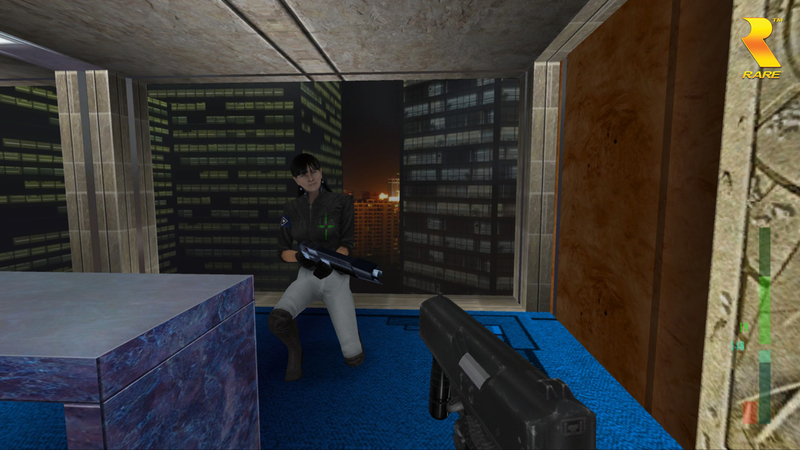 Man it was sweet to control enemy characters in the counter-operative mode. My friends had no idea how evil I could be to thwart Joanna's objectives. 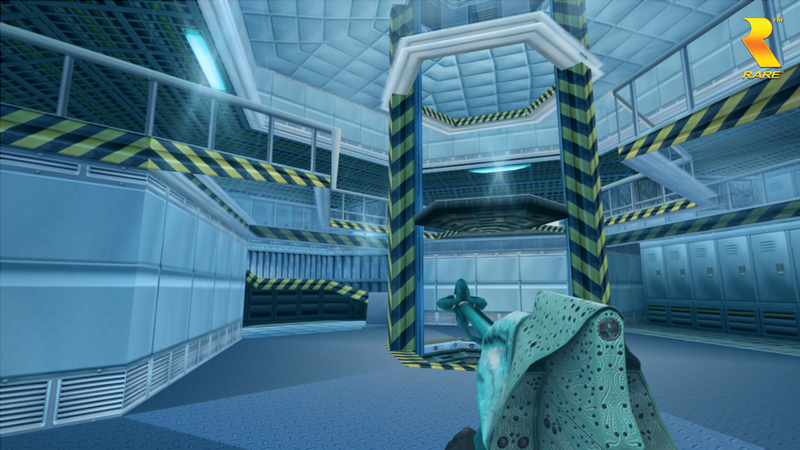 The splitscreen screenshot shows off decent textures and nice lighting. What are still being denied the face of the next gen Joanna. Hopefully the developers increased the audio quality so the characters don't sound like they are recorded through an ancient microphone. In conclusion, based off the screenshots, it appears the game has taken an excellent step forward with the new character textures. In contrast, the shadow engine needs to be revamped so it is not directly porting the light cells of the N64 generation. The shadows in the screenshots confuse me because the DataDyne and the interior base shots look great. Then I am smashed against a tide of shadows arbitrarily ending with solid lines. Please add soft shadows to the game or allow a special next next gen lighting option for true dynamic lighting. I would buy the game if I had a 360. Unfortunately, I can't justify a purchase of more than $100 to play a classic I could play on my 64 or elsewhere. So the port gets my praise, and my money if I can access a 360.